We are pleased to announce the publication of a biography of Rabbi Yoel Teitelbaum (1887-1979), rabbi of Satmar, Hungary and founder and leader of the Satmar community in New York. Rabbi Teitelbaum, known simply as the Rebbe, wrote many lengthy books against Zionism, and they have become the bible and starting point for all thought and ideology in this area. Torah Jews from all circles continue to derive their inspiration from him. 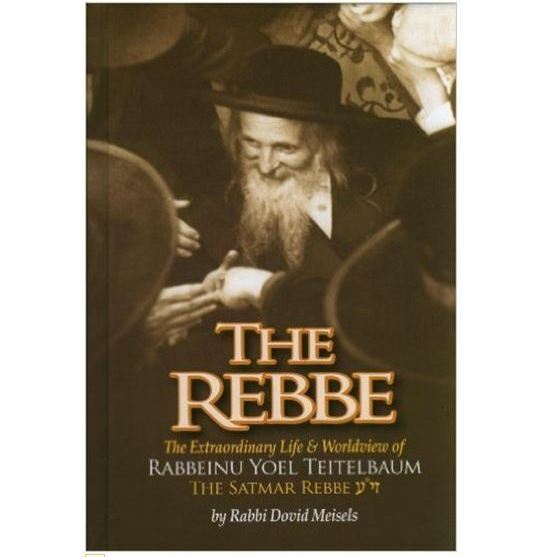 The book is called "The Rebbe: The Extraordinary Life and Worldview of Rabbeinu Yoel Teitelbaum." It can be purchased here, as well as in your local Judaica store. The book contains four long sections (out of a total of twelve) detailing the battle against Zionism waged by the Rebbe and other rabbis of his time. The rise of the movements of Zionism, Mizrachi and Agudath Israel are all described, with the Rebbe's reactions to them. The establishment of the state, as well as the Rebbe's numerous public demonstrations against it are described. Also covered are the Rebbe's visits to the Holy Land, during which he gave vital spiritual and material support to the anti-Zionist Jewish communities there. There is a section on the Rebbe's magnum opus, Vayoel Moshe, as well as a section on his activities and positions in the wake of the 1967 war. The book also gives a general picture of who the Rebbe was and what he accomplished for Jewry in America. There were many rabbis who bridged the gap of the Holocaust and rebuilt Jewry in America. Some built yeshivas, some built girls' schools, some took responsibility to decide halachic issues, some established kashrus and some dedicated their lives to distributing charity. The Satmar Rebbe stands out in that he did all of the above, and yet there was more. He was unique in his ambition to rebuild an entire European Jewish community in America - an ambition in which he succeeded even beyond his own expectations. His main guiding principle was truth - to stick to the authentic Torah, even at a time when many opposed him. He held that most of the mistakes made by others in his time had been due to the pressures of chanufah - the perceived need to please the wicked. While others made small concessions in Jewish observance in consideration of the time and place, the Rebbe believed that with G-d, there can be no compromises. We must continue with what we received from our parents and teachers - in matters of modesty, Torah and Jewish faith. The feat of transplanting Europe to America is all the more amazing when we realize how much the Rebbe suffered for his outspoken stance on Zionism, and his conviction that all the great pre-war rabbis who opposed Zionism were not made irrelevant by the emergence of the state. Many people who would have supported his efforts withdrew their hands, and the Rebbe's accomplishments were built largely on the meager contributions of poor wage-earners, almost all recent immigrants. Today, the Rebbe's followers number over 150,000 and live in Brooklyn, Monroe, Montreal, London, Jerusalem and many other cities around the world. It has been more than thirty years since the Rebbe's passing and until now, no biography of him has appeared in English, although many have appeared in Yiddish and Lashon Hakodesh. One reason for this may be the Rebbe's strong opposition to the use of English as a medium of speaking and reading within the Jewish community. But as the years go by, demand has mounted outside the Satmar community for information about the Rebbe's life, his positions and achievements. The biography was written by Yirmiyahu Cohen (who also serves as a staff writer for True Torah Jews) under the direction of Rabbi Dovid Meisels, author of the popular Secrets series. Rabbi Meisels is a grandson of the Veitzener Rav, Rabbi Tzvi Hirsch Meisels, whose mother was the Rebbe's first cousin. The Veitzener Rav was a devoted follower of the Rebbe who worked closely with him throughout his life, and raised his family in the Satmar path.